Year 2014 is a challenging year for the country for the reason that there were lots of issues that came out this year concerning Politics, Economics, Natural Disasters and Recovery, and different topics that trended in the social media and have been the talk-of-the-town. KWATROBersyal and is derived from the word “controversial” as all of these issues became the nose of the news this year. Issues were group in to Politics “PULITIKA”, Economics “EKONOMIYA”, Disasters and Rehabilitation “Kalamidad at Pagbangon”, and Trending Topics “TRENDING”. All of these issues were given by The Veronica Chronicles for its 2014 episodes an in-depth discussion were all facts and salient matters were presented and laid out through the different reliable sources and involved groups and personalities. Together with veteran broadcast journalist, Miss Veronica Baluyut-Jimenez, are Political Analyst and Academician, Prof. Ramon Casiple, Multi-Media Blogger and Writer of Blog Watch Citizen Media, Ms. Noemi Lardizabal-Dado, Online and Print Journalist/Writer, Ms. Ellen Tordesillas, Former Deputy Speaker for Luzon, Cong. Erin Tañada and Former Bayan Muna Representative and Writer, Cong. Teddy Casiño. On the other hand, the issues being faced by the second highest official of the land, Vice President Jejomar C. Binay of its alleged unexplained wealth which has started on the investigation of the P 2.8 Billion pesos Makati Building 2 and has sprouted to other projects and personal properties. The problem in our Public Transport System is one of the issues discussed in this group and how this affects the growth of the economy of the Philippines. Also, the traffic issue which was triggered by the congestion in our International and Domestic Ports and interrelated to the different truck ban ordinances being imposed by the different city governments and agencies and unregulated policies. The President visited the different allied countries this year to strengthen the economic relationship of the Philippines to them and said that many foreign investors will be coming to the country by the next succeeding years. Did we really felt the growth in our economy? And the relationship of a sustainable Transport System to the economy of the country? Last year, Supertyphoon Yolanda struck the Visayas Region and left thousands of deaths and thousands missing and brought down infrastructure and livelihood. And this year, we commemorated the First Anniversary of Yolanda and yet, we are still in the phase of recovery and rehabilitation. What are the challenges being faced by the government and how are they going to implement the P170 Billion Comprehensive Rehabilitation and Recovery Plan to the typhoon ravaged areas? Jeffrey “Jennifer” Laude and the alleged perpetrator, the United States Marine Officer, PVT First Class Joseph Scoot Pemberton. Will the Laude Family get justice? and how will the case progress when the evidences presented excludes the suspect from the case? 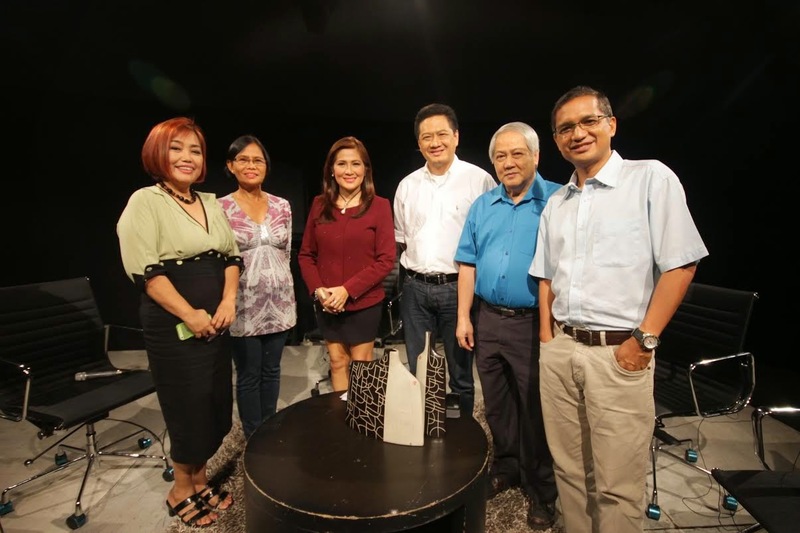 This Monday, December 15, 2014, 8-9PM at People’s Television Network, Inc. (PTV4) hosted by veteran broadcaster, Miss Veronica Baluyut-Jimenez.